Volcán is a town set in the highlands of the Chiriquí province, in western Panama, shadowed by Panama’s only volcano, Volcán Baru. Most people visiting the Chiriquí province probably won’t have heard of Volcán, but that is exactly what has kept this part of the province so special and unchanged. Due to its rich volcanic soil Volcán is deemed the “breadbasket of Panama” producing most of the countries vegetables such as onions, potatoes, carrots, and more. In addition, most of the flowers and bouquets enjoyed by Panamanians all over the country are grown in Volcán. It’s cool year-round climate and altitude allows many species of plants, trees and flowers to flourish here that you won’t find in other parts of Panama. The town’s commercial district is about 10 blocks long located on the main road in and out of town. Homes in Volcán tend to be located on large lots with plenty of space between houses, and breathtaking views of the impressive 11,640 feet, Volcán Baru, and the surrounding valley. Volcán has all the basic amenities, from hardware stores, gas stations, bakeries, grocery stores, restaurants, boutique hotels, banks, and even an ice cream shop. In fact, several local businesses are owned by expats. A new hospital opened in Volcán in 2014 serving as a basic emergency care facility, but for major operations and advanced care Concepcion is only 30 minutes away. The nearest city is David, a quick 40-minute drive from Volcan, here you fill find hospitals, shopping, and services not available in Volcán as well as the local airport which services flights to Panama City. It also has the added benefit of having the beach if you want a change of pace for the day. The lifestyle in Volcán is laidback and quiet, and most expats enjoy social interaction by visiting friends and going to local expat hangouts on weekends. The Wandering Sloth Bar and Grill is a popular hangout for expats. Besides serving great food, on the weekends you can find expat musicians playing old favorites. The Caballo Loco bar attached to the back of the Mana Restaurant is another great place for expats to gather and make new friends. The Mana Volcán Lodge hosts the Farmers market every Friday, offering you the opportunity to pick up an array of fresh picked vegetables while also catching up with your neighbors. Due to a small expat population, just around 250 people, the expat community in Volcán, tends to be friendly and supportive of each other. Living in Volcán will require you to know some Spanish to be able to communicate with the locals and do business. Volcán is perfect for nature lovers. 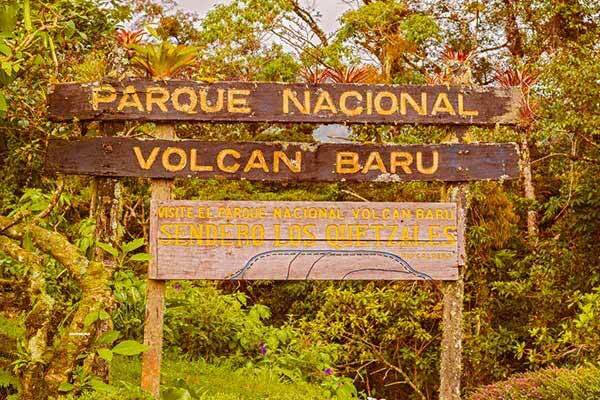 Volcán Baru National Park, and La Amistad Park are close by offering hiking trails into the protected forests and jungles. For bird watchers, these areas are the best places in Panama to see the elusive Quetzal bird, and you can spend hours hiking and experiencing the natural wildlife that only exists here. A popular hike is to the top of Volcán Baru where on a clear day you can see both the Pacific, and Atlantic oceans. And the Chiriquí river and lake Las Lagunas, just outside of town cater to any fishing enthusiasts needs. Health is another benefit of living in Volcán, from breathing in fresh mountain air, eating fresh healthy food, and living a relaxed lifestyle, the towns ensures a wholesome way of life. Housing prices in Volcán are less than neighboring David and Boquete, with homes starting at $125,000, and rent for a two-bedroom apartment around $700 a month. The pleasant temperatures here are also easy on the budget, which means there is no need for air-conditioning or heat. Though the greatest savings of living in Volcán compared to other places in Chiriquí is the lower cost of entertainment and rent. Volcán is a healthy and affordable place to live, perfect for those looking for a quiet, slow-paced lifestyle, within easy reach of a city and a beach.